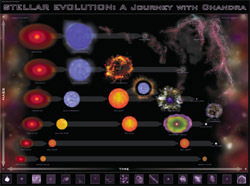 interactive Flash features from Chandra. When the Universe came into existence ~14 billion years ago, the only elements were hydrogen, helium, and traces of lithium, beryllium, and boron. The heavier elements did not yet exist. Heavy elements are produced by nucleosysthesis — the fusion of nuclei deep within the cores of stars. At some point in time, the first stars were formed, and within their cores the fusion process created heavier and heavier elements; the most massive stars produced nuclei as heavy as iron. When the stars used up their nuclear fuel, they started to evolve. The evolutionary processes of stars depend upon their initial mass. Mid-sized stars eject planetary nebulae, leaving a white dwarf core remnant. More massive stars explode as supernovae, leaving neutron stars or black holes at the centers of the supernovae remnants. The elements that were created within the cores of the first stars were ejected into space where they intermingled with the surrounding interstellar medium. This medium — the gas and dust between the stars — provides the raw material for the formation of new generations of stars. Eventually, these elements became incorporated into large clouds of gas and dust that condensed and formed protostars. And so the cycle of stellar formation and destruction continues — each new generation further enriching the interstellar medium with heavy elements that become incorporated into the next generation. We are just beginning to understand stellar formation and destruction — and how the Sun, Solar System and life on Earth are connected to this never-ending cycle. Educators: Please note, the card sets for the Stellar Evolution module are available by request.